This recipe for Sweet Sour Meatballs has a great memory tied to it. It really reminds me of my childhood. We lived in Japan in the early 60’s, and in fact, I was born there. Well, one of the treasures that we brought back from Japan was a cookbook called “The Art of Chinese Cooking”. My mom used to cook many of the recipes found in this book. We always thought they were so exotic compared to our usual baked chicken or spaghetti. My mom was really the one that started the appetizer tradition for Christmas. She loved Christmas and was the one who inspired me to be a good cook. 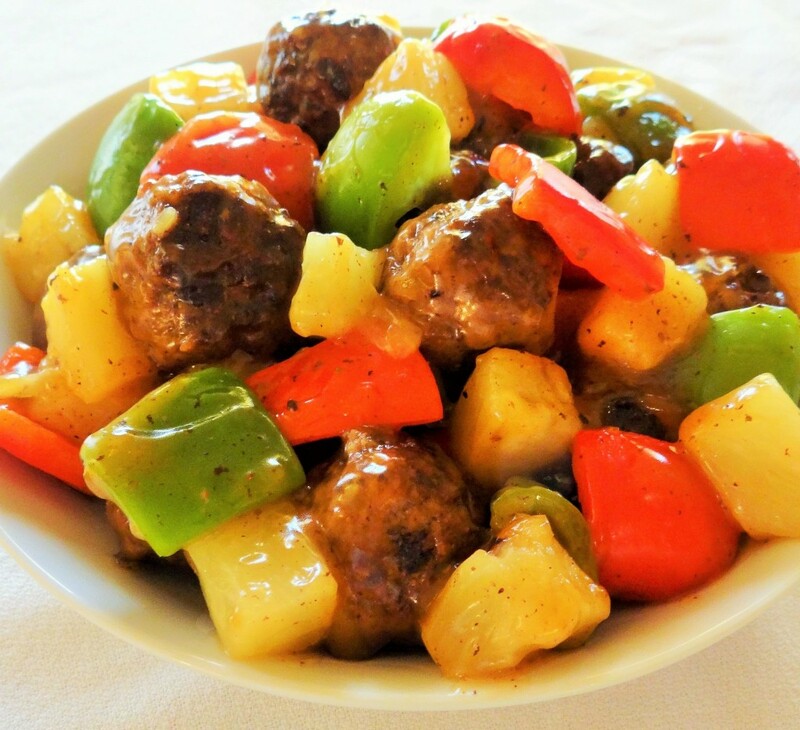 Although Sweet Sour Meatballs are a main dish recipe, I decided to make it as an appetizer for my holiday table. 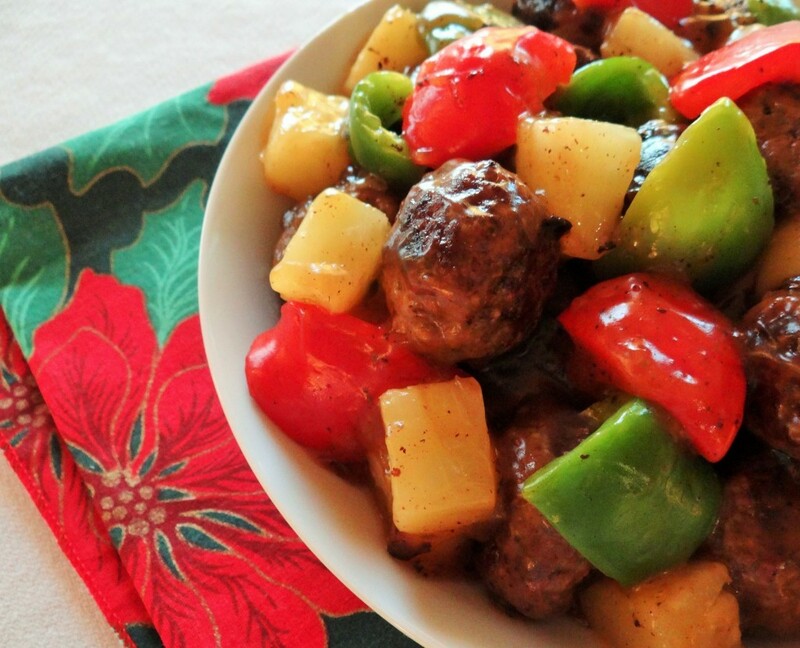 The beautiful red and green peppers are so colorful and really make it a special holiday dish. So, on the seventh day of appetizers, Dianna is bringing to you, a recipe that reminds me of my mom, who loved Christmas…Sweet Sour Meatballs. Mix together ground beef, egg, 1 tablespoon cornstarch, salt and onion. Form into 18 or more balls. Place 1 tablespoon olive oil in a frying pan. Brown meatballs, turning every 3 minutes. Drain on a paper towel lined plate. In a sauce pan, place 1 tablespoon olive oil and pineapple juice. Cook on low heat for 2 minutes. In a bowl, combine 3 tablespoons cornstarch, soy sauce, vinegar, water and sugar. Whisk until smooth. Pour into sauce pan. Cook on medium heat, stirring constantly until sauce thickens. Add meatballs, peppers and pineapple. Heat thoroughly. Serve hot.